La Mere Catherine is classed as a bistro in Paris that was originally founded back in 1793 in the Montmartre area close to the Saint-Pierre de Montmartre church and on the famous Place du Tertre square at the top of Butte Montmartre. 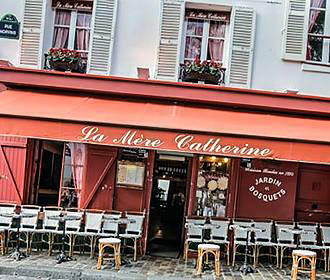 The original Catherine bar in Paris was founded by Catherine Lemoine in 1793 and hence the name of La Mere Catherine and was utilised by the rectory of the Eglise Saint-Pierre de Montmartre church and has been frequented by locals, soldiers, and tourists ever since. Even back then it was situated at 6 Rue Norvins, which looks out over the Place du Tertre, and inside you will feel like you are being taken back in time with dark walls adorned by old paintings, the red leather bench seats and wooden chairs, along with red and white chequered table cloths that gives it a cottage style feel. But this bistro style restaurant in Paris has come a long way from its humble beginnings and there is a fabulous choice of cuisine on offer, not forgetting that there is often a singer providing a reminder of the famous songs of Edith Piaf. 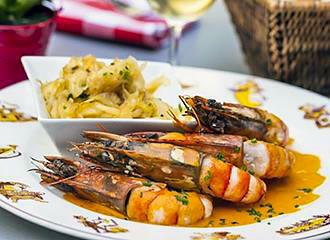 Today you will find that the food served at La Mere Catherine is wholesome typical French cuisine with lots of traditional dishes you can choose from and there are many delights on offer from the a la carte menu. For starters you could choose onion soup, a selection of seafood or cold meats or escargots, which are snails from the Burgundy region with garlic butter and these range in price from €10 up to around €25. You could then opt for a pasta or salad such as tagliatelle with tomatoes and basil or a salad with melted goats cheese for instance and these are around €12 up to €18. However, you could choose a fish course such as grilled salmon with a bearnaise sauce, roasted sea bass with fennel or monkfish and scallops pot and these are from around €18 up to €26, but the cheapest option is mussels with French fries at a cost of approximately €14 as of 2013. But for those of you that are meat lovers, the Mere Catherine has a wide selection of dishes available such as flamed veal kidneys in cognac, a roast rack of lamb, a grilled rib eye steak with bearnaise sauce or duck breast with honey and orange sauce. And these are an approximate cost from €19 to €27, but the least expensive meat dish on the menu is beef tartar and French fries for around €16 as of 2013. 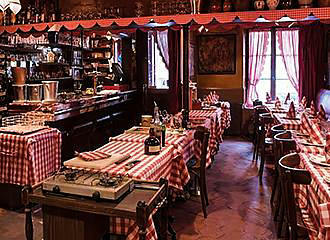 Now you could then opt just for an assortment of cheeses or coffee and a dessert assortment of nibbles, but there are other tempting sweets such as crème brulee, chocolate mousse or an apple and grape crumble, yet the crepes are exceedingly popular and you can order crepes suzette for two people. They also have a wide variety of different French wines that are served either by the glass or half bottle along with aperitifs, soft drinks and coffee. 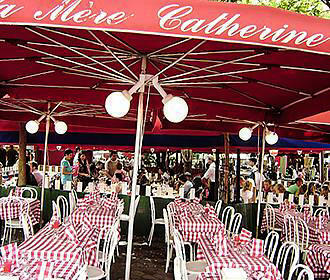 La Mere Catherine is open seven days a week from midday through to midnight for non stop service, and during the warmer months there is a terrace where you can sit and watch the hustle and bustle of Parisian life and the many tourists. However, we would like to point out that the toilets can only be accessed via a flight of stairs and therefore this is not the ideal place for the disabled, but of course, there are many other cafes nearby to choose from that may be more suitable for those less able. Now, this restaurant style Bistro in Paris is located on Rue Norvins at the Place du Tertre within the 18th Arrondissement at the top of the Montmartre hill, and it is also very close to the Saint-Pierre de Montmartre church and Sacre Couer Basilica. And this does mean that you either have to be fit to negotiate the many steps up the Montmartre hill, or you would need to take the Montmartrobus. However, you can get to the Montmartre area via Metro via the Abesses stop or the Anvers stop then take the Funicular, which is the cable car that avoids the steps.